At 7 and a half years old, Alice is the protagonist of the tale. 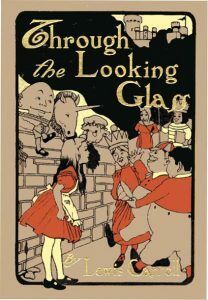 Her adventures in Looking-Glass World present challenges to all of her perceptions and preconceived notions of the world. Because she approaches everything she sees with a firm sense of order, she unintentionally alienates nearly every character she encounters. She is a domineering ruler and singularly unpleasant to Alice. She criticizes Alice for her lack of proper manners. It is the Red Queen who initiates the chess game. The game of chess functions as a central metaphor in the story. Acting as something of a counter to the Red Queen, the White Queen explains the order and rules of Looking-Glass World. However, she herself is untidy and messy. She embodies the general reversal of order in Looking-Glass World. The sleeping king. Tweedledee and Tweedledum explain that everything that is happening to Alice is actually part of the Red King’s dream. It is the White King who sends his men to re-assemble Humpty Dumpty, and it is he who leads everyone to the climactic battle between the Lion and the Unicorn even though he is terrified of them. He takes all words quite literally. He ends up being Alice’s only real companion through all of her adventures. He is noble but his appearance is old and shaggy. Like other characters, his outward appearance is the opposite of his inner self. An egg-like man, he is filled with self-importance as much as his physical body is fragile. He claims to be a master of words and is able to make up the meanings of words at will. He “explains” the Jabberwocky, but changes the meanings of all the words. The unstable meanings of words are a central feature of the story.